Labor’s Minister for Agriculture, Fisheries and Forestry Joe Ludwig may have needed reminding to express shock at the appalling footage from Karachi, but most Australians did not require instruction to denounce the actions of the authorities in Pakistan for what they were: unnecessary, inhumane and unacceptable. The live export trade is profoundly unpopular with the Australian public, an unpopularity which, as Gonzalo Villanueva recently pointed out, is by no means confined to radical animal liberationist circles. Tens of thousands of Australians marched on parliament buildings around the country last month to call for an end to the trade. The animal welfare debate has always turned on the effectiveness of video footage as a swayer of public opinion (presumably one reason why calls for the mandatory installation of CCTV cameras in slaughterhouses continue to be rejected). It is little wonder, then, that Four Corners has been so successful in generating widespread disapproval of the live export industry. Citing New Zealand’s cessation of live animal exports as a model, Animals Australia has been arguing for years that onshore processing is not only more humane but better for jobs and the economy as well. Embedded in all this is a startling contradiction, captured by a 2010 Newspoll telephone survey. 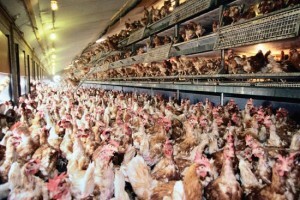 The survey found that 99 per cent of respondents claimed to be opposed to animal cruelty and that 98 per cent said that they eat animals and fish which come from cruel, intensive farming practices. Only 5 per cent identified as vegetarian. Whether or not you eat meat, the disconnect between our concern for animal welfare and our eating habits is clear. Are you sure you enjoy factory food? To put this disconnect into concrete terms, let us take the example of poultry. 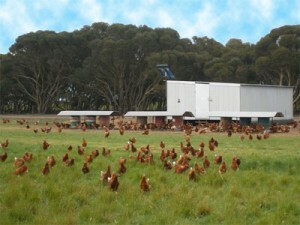 470 million broilers (meat chickens) are slaughtered for human consumption in Australia every year. Only 3 per cent of this meat is exported. 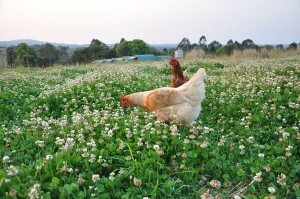 If a label doesn’t state the farming practices used, the chicken has probably come from a factory farm. We might imagine that chickens do not share the same emotional and cognitive abilities we know larger animals such as cows, pigs and sheep posses. This belief has been exposed as misguided by, among others, the Australian neuroscientist and animal behaviour expert Professor Lesley Rogers who argued in her 1996 book The Development of Brain and Behaviour in the Chicken that ‘birds have cognitive capacities equivalent to those of mammals, even primates.’ We are, in short, deluding ourselves if we think that chickens are incapable of profound emotional and physical deprivation and suffering. We might imagine, also, that there is no double standard present in condemning the inhumane slaughter of live animals exported overseas while remaining silent about the cruelty that occurs in Australian factory farms and slaughterhouses. It would be foolish to argue that laxer regulation and, in some instances, merciless religious edicts do not make animal slaughter in countries like Pakistan and Indonesia far bloodier than anything we know of taking place in Australia. But have we so quickly and carelessly forgotten our own brutalities? In May, a NSW government review found animal welfare breaches in all ten of the state’s red meat abattoirs. At about the same time, it was revealed that the Hawkesbury Valley Meat Processors abattoir at Wilberforce was fined just $5,200 after a horrific video recorded by two insiders was made public. It’s a dismally small sum. If I were found guilty of an act of animal cruelty in NSW I could be made to pay $22,000, or sent to jail for five years. The Crimes Act 1900 which allows for this lengthy sentence stipulates that the punishment is applicable to persons found guilty of serious animal cruelty with ‘intention of inflicting severe harm.’ Once again, a sweeping double standard applies; if I cut my dog’s tail off, clipped his teeth or castrated him – all without pain relief – I could be fined thousands of dollars or imprisoned for years. These things happen every day to male pigs in Australia’s factory farms as a matter of routine. The reality is that the mainstream anti-live export campaign, whilst laudable, conceals a dark truth about our relationship with animals: that we are happy to condemn the cruelty inherent in the trade of live animals to other countries but are unwilling to confront the daily horrors of our own factory farms because that would mean having to change the way we shop and the way we eat. There is, as an RSPCA spokesperson told me, still a lot of work to be done to educate consumers about the huge impact that they can have in reducing the suffering of animals by making ‘higher welfare’ choices at the supermarket. That – and not responsibility-free outrage at what goes on in faraway lands – is where we can really begin to undo the lethal paradoxes which have so far defined our relationship with animals both great and small. This entry was posted in Animals and tagged activism, animal cruelty, animal rights, factory farming, live exports by Ben Brooker. Bookmark the permalink.